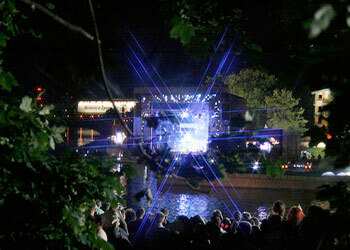 As the longest day of the year unfolds, Krakow’s Vistula river will become the site of the city’s yearly midsummer musical extravaganza. This Saturday, the 20th of June, will feature a massive free concert on the banks of the river, with five performers and a fireworks show to top it all off. None other than Lenny Kravitz will take the stage as the night’s headliner, promoting his latest studio album, It is Time for a Love Revolution. But of course the night is not just about Lenny. “Wianki”, after all, means “wreathes”, and it’s the wreathes or garlands that are the crux of the festivities on St. John’s Eve. Activities include a “most beautiful garland” contest, as well as the floating of the wreathes in the afternoon. The legend goes that the fate of a young maiden’s wreathe as it sails down the Vistula will determine her fate. If the wreathe sinks or gets stuck in the plant life, she can expect to remain alone (perhaps with some feline company), or at best look forward to a complicated love life. But, if the wreathe floats down the river or is scooped up by her beloved, marriage and happiness are soon to follow (though the tradition is fuzzy about the details, such as divorce rate of successful wreathe floaters). These days, it’s all in good fun and few fret that their fortunes are tied to their wreathe’s fate.